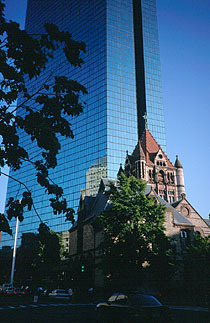 The John Hancock Tower is the tallest building in New England, and stands sleekly on its own in Copley Square, away from the high-rise area of Boston's downtown. Despite is enormity in its local area, its presence is made less overpowering by its pure, crystal-like geometry and reflecting glass skin. 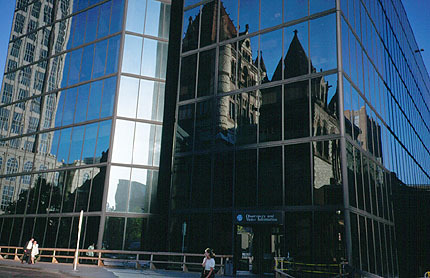 The dominant view when you are close to the building is of the nearby historical buildings reflected with subtle distortions of color and shape in the Hancock Tower's glass. The glass skin suffered massive technical problems when first built: many of the 10,000 windows habitually fell out, as the building responded to the pressures of wind and changing heat. Solutions to this problem included installing a network of 10,000 sensors stuck on each window, giving a special control room early warning of when a window's vibration suggested it might be next to go. Not a story to remember when you're standing next to the floor-to-ceiling windows on the (now closed) 60th floor observation deck. 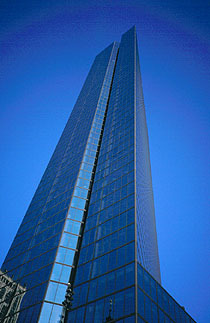 With its windows now securely in place, the Hancock Tower has regained its purity and elegance - especially on a sunny day when it appears almost transparent against a deep blue sky. Since September 2001, the interior of the building, including the 60th floor observatory, has been closed to the public. Not cheap, but popular, well reviewed, and by the author of Shaping a Nation - a master at architectural writing that is both accessible and insightful. Pei Cobb Freed and Partners give a brief account of the building at www.pcfandp.com.